OSell Selection is an online and offline service channel which established by Osell. The one end connects market、manufacturer direct purchasing, on the other end connects overseas SME purchasers; meanwhile integrating business opportunity platform, Cross-border supply chain financial service、 Source of factory purchasing management service、De-centralization advertising service、Cross-border e-commerce social service,etc. Constituting an intelligent Big Data trading platform and bringing integral mechanism of cross-border Eco-construction which records the social and business behavior of cross-border business.The more active, the more incentive. Ultimately implement to help the global SME enterprise purchase from factory directly, With trading financial services, doing global business without going out! Who can join OSell Selection ? Global commodity supplier、Terminal purchaser and consumer、Third party service organization. What can OSell Selection do? Through OSell Selection platform, The global commodity supplier can direct to global terminal purchaser and consumer, releasing various products and services. establishing interaction with consumer by advertising、prize reading, etc.Getting customer feedback on products、inquiry information、order consumption,etc. 2，Through the cooperation with various application partners of business eco-construction, make point-system to circulate on the platform, meanwhile support the third party application access to platform,provide customers with more business SNS services activities place, build a high-activeness ecosystem of customers on the platform. OSell Selection platform embed De-centralization advertising module of Odoor which based on blockchain technology, merchant can advertise on various social platforms, through the Big Data of purchaser and consumer behavior to form cross-border business matching order report，greatly facilitate the order transaction. OSell Selection platform offer various one-stop cross-border international trade service for commodity supplier, including community interaction、commodity service、 third party logistic、trading guarantee、financialbusiness,etc. Merchants can release products、promote Ads、collect Silkpay and enjoy supply-chain financial service on OSell Selection. Through OSell Selection, terminal clients can purchase products、prize reading、rewards for active mining 、entertainment expenses, etc. Through the Point Empowerment of business Eco-motivation brings user and traffic,increase Customer stickiness,enjoy community bonus of Silk Point. OSell Selection platform embed digital currency payment product -SilkPay launched by Silkchain. Users can shop on the platform by using silk point,legal tender and other digital currency through SilkPay, especially suitable for emerging economies. 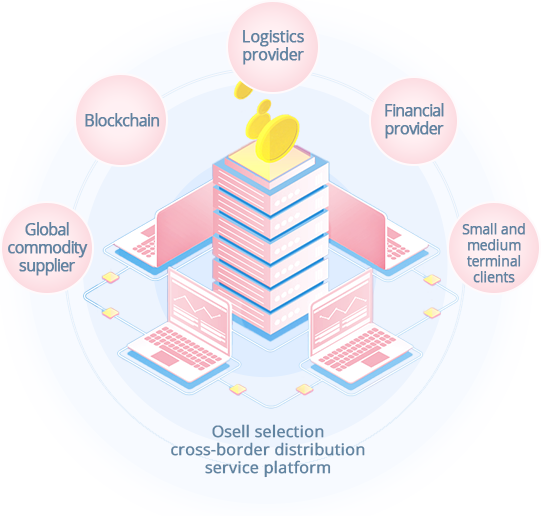 By accessing third-party financial service products to Osell, purchaser can import goods from China with a small upfront payment, the remaining payment and service fee can pay later, It greatly reduces the financial pressure and risk of buyers, thus promoting the business matching and increasing the trading volume on the platform. Currently,In 11 countries around the world（Russia, Poland, Canada, uae, Vietnam, bahrain, Indonesia, Oman, Kenya, Saudi Arabia, Malaysia) Osell had cooperated more than thousands of overseas business channels which include big markets、SME wholesalers、retailers、professional buyers,etc. [Massive Selection] access to global quality products in real-time. [Trade leads Matching] nonstop orders to be matched with supply. [View ADs Get Rewards] View ads, comment and share ads, and get rewarded. [Order Profit] Purchasing from Mall directly, deal-making the exchange of large orders. [Easy Conversion] Blockchain technology，solve the pain point of settlement. ● Enter the password of the platform account in the landing interface to login OSell Selection App. ● New user to click “Register”and fill in the basic information to register. ● Deal the Order! Enjoy the dividend!